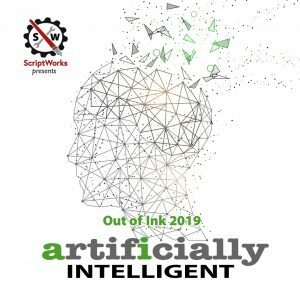 Robots, automatons, household appliances, and humans are a few of the artificially “intelligent” characters in this year’s Out of Ink production inspired by one of the three contributed rules or ingredients used to write the plays. ScriptWorks members employed these elements to create their ten-minute masterpieces over 48 hours during the Weekend Fling in the fall. 1) At least one character who is artificially “intelligent. At the end of the Weekend Fling, the plays were read in a ScriptWorks Salon at Shalom Austin. A selection committee chose eight plays for production in Out of Ink, from the two dozen plus plays that were submitted. The committee was comprised of costume designer Pam Friday, ScriptWorks board member, Aaron M. Clay, and former member and Out of Ink playwright, Meg Haley. Robin Anderson, Trey Deason, Max Langert, Tristan Young Mercado, Aneesa Needel, Jason Rainey, Nettie Reynolds, and Sarah Saltwick. The plays will be performed by an ensemble of actors comprised of Roxy Becker, Amy Chang, Dan Dalbout, Lana Dieterich, Karina Dominguez, David DuBose, Matrex Kilgore, Alexandra Nicole Marosis, Cherry Mendoza, Susan Myburgh, and Tony Salinas. They’ll be directed by Ellie McBride, Linda Nenno, Rudy Ramirez, and Sharon Sparlin. Designers for the project are Lowell Bartholomee, Pam Friday, John Michael Hoke, and Amy Lewis.